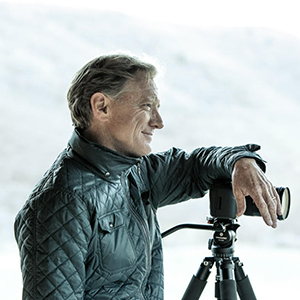 James Redford writes, produces, and directs for film and television. His films include Resilience, Paper Tigers, The Big Picture: Rethinking Dyslexia, Mann V. Ford, The Kindness of Strangers, and Toxic Hot Seat. Redford is the co-founder and chair of The Redford Center, a non-profit organization committed to transforming environmental and social challenges into stories that inspire action and change. Jim is currently working as a trauma-informed coach / consultant as well as a trainer with the Children’s Resilience Initiative, based in Walla Walla. His travels as a consultant, keynote speaker, presenter and trainer have taken him all over the United States. Jim is married, has three daughters and six granddaughters. In his spare time, Jim enjoys fishing, hunting, but most of all spending time with family. A pioneer in the field of medicine, Dr. Burke Harris is a leader in the movement to transform how we respond to early childhood adversity and the resulting toxic stress that dramatically impacts our health and longevity. By revealing the science behind childhood adversity, she offers a new way to understand the adverse events that affect all of us throughout our lifetimes. Burke Harris speaks to how we can disrupt this destructive cycle through interventions that help retrain the brain and body, foster resilience, and help children, families and adults live healthier, happier lives. 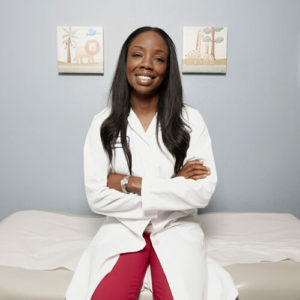 A pediatrician, mom and the founder/CEO of the Center for Youth Wellness, Burke Harris has brought these scientific discoveries and her new approach to audiences at the Mayo Clinic, American Academy of Pediatrics and Google Zeitgeist. Alice M. Forrester, PhD, is chief executive officer at Clifford Beers Clinic (New Haven, CT). That agency is featured in the documentary Resilience: The Biology of Stress and the Science of Hope (2016) produced by KPJR Films and directed by James Redford. Under Dr. Forrester’s leadership, the agency provides integrated services to address mental health, physical health and social determinants of health. Because family is so important in recovery, care is “whole”-istic in terms of the whole person and whole family. Forrester is widely viewed as a thought leader in her field. 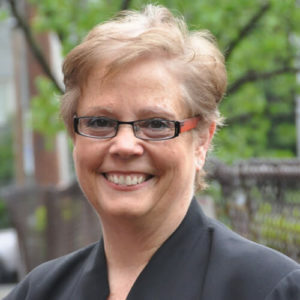 She has served on multiple local, state and national councils including the National Child Traumatic Stress Network Steering Committee, the State of Connecticut Behavioral Health Partnership Oversight Council, the Tow Youth Justice Institute Advisory Council, the Sandy Hook (CT) Commission, and the City of New Haven Substance Abuse Council. She is sought by government officials to inform policy and implement change, e.g., Forrester was appointed by Gov. Dannel Malloy to the Sandy Hook Commission following the 12/14/12 mass shooting tragedy at Sandy Hook Elementary School (Newtown, CT). She was specifically asked to investigate and recommend changes to child mental health delivery systems via early intervention and prevention. Her commitment to innovation led Clifford Beers to winning a $9.7 million Centers for Medicare and Medicaid Services Healthcare Innovation grant designed to prove the impact of integrated care combined with in-home intensive care coordination for families living under chronic stress and with complex biopsychosocial issues (currently in progress). 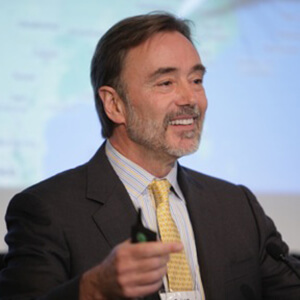 Forrester has traveled the nation addressing vast and varied audiences – from New York City public school physicians to religious leaders in Lake Forest, California – on topics such as trauma, resiliency, the framework for school-based/trauma-informed change, quality management, and integrated care. She has designed and is overseeing a team at the Clinic dedicated to helping schools implement a trauma-informed framework for change at the district-wide level. Leadership posts in the private sector include board membership at The Alliance (a Connecticut nonprofit action group), and board chair for both the National Association for Drama Therapy and the National Coalition for Creative Arts Therapies Associations. Dr. Forrester holds an MA from New York University (drama therapy) and a PhD from Fielding University (clinical psychology). She resides in New Haven with her partner and their three adopted children, Elizabeth, Daniel and Camille. More information about Clifford Beers can be found at www.cliffordbeers.org. Forrester can be reached at aforrester@cliffordbeers.org. Dr. Rob Anda lives in Atlanta, Georgia. 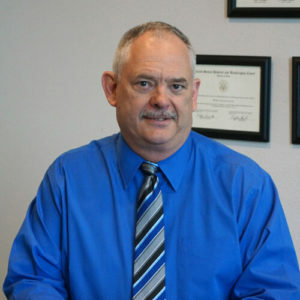 Dr. Anda graduated from Rush Medical College in 1979 and received his Board Certification in Internal Medicine in 1982. During 1982-1984 he completed a Fellowship in Preventive Medicine at the University of Wisconsin where he also received a Masters Degree (MS) in Epidemiology. He spent 20 years conducting research as a medical officer in the U.S. Public Health Service at the Centers for Disease Control and Prevention (CDC) in Atlanta. His research involved a variety of areas including disease surveillance, behavioral health, mental health and disease, cardiovascular disease, and childhood determinants of health. He played the principal role in the design of the Adverse Childhood Experiences (ACE) Study and serves as its Co-Principal Investigator. He has presented findings from the ACE Study at Congressional Briefings and numerous conferences around the world. The ACE Study is being replicated in numerous countries by the World Health Organization (WHO) and is now being used to assess the childhood origins of health and social problems in more than 30 U.S. states. He has more than 200 peer-reviewed and government publications such as the Morbidity and Mortality Weekly Report (MMWR) and book chapters. In addition, he has received numerous awards and recognition for scientific achievements. He and his work are highlighted in the documentary “Resilience” by Jamie Redford that was accepted to the 2015 Sundance Film Festival and is now being shown across the nation. 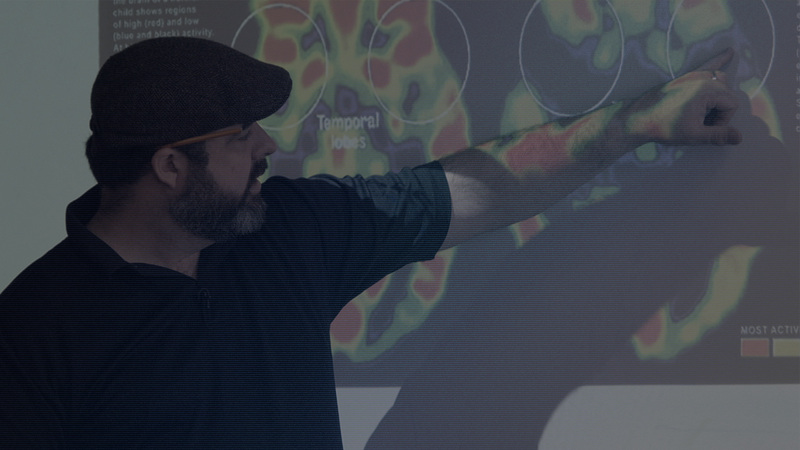 Dr. Anda now works in his role as Co-Founder of ACE Interface to deliver training materials at the state and community level about neurobiology, epigenetics, ACEs, resilience, and community capacity development. His dream is to help create a trauma informed Nation. His role as the designer, writer, and communicator about the ACE Study over the past 25 years and how it has evolved into a National movement provides unique insights and perspectives for professional and lay audiences alike. Dr. David Johnson is the lead creator of the ALIVE and Miss Kendra programs, highlighted in James Redford’s acclaimed documentary Resilience: The Biology of Stress and the Science of Hope. Spanning a long career in the study and treatment of Post Traumatic Stress Disorder, Dr. Johnson is one of the pioneers who have turned the implications of the ground-breaking ACEs studies of Felitti, Anda and others into real-world, preventive programs for children in schools and communities devastated by toxic stress, violence and trauma. Dr. Johnson has published more than 120 articles and chapters and 10 books on trauma and the creative arts therapies, and has been on the faculty of Yale University’s School of Medicine for more than 35 years. 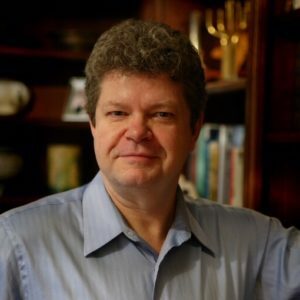 He is the Co-Director (with Dr. Hadar Lubin) of the Post Traumatic Stress Center in New Haven, Connecticut, and the Chief Executive Officer of the ALIVE program. As a speaker, Dr. Johnson passionately advocates for preventative public health measures to combat child abuse and articulates the principles and methods of ALIVE which have turned schools and classrooms into trauma-sensitive, animated, open forums and greatly reduces negative behaviors. Dr. Johnson and his team’s inspiring work has been in the classrooms, in the projects and in the streets, dealing with the real challenge of implementing a trauma-informed program. 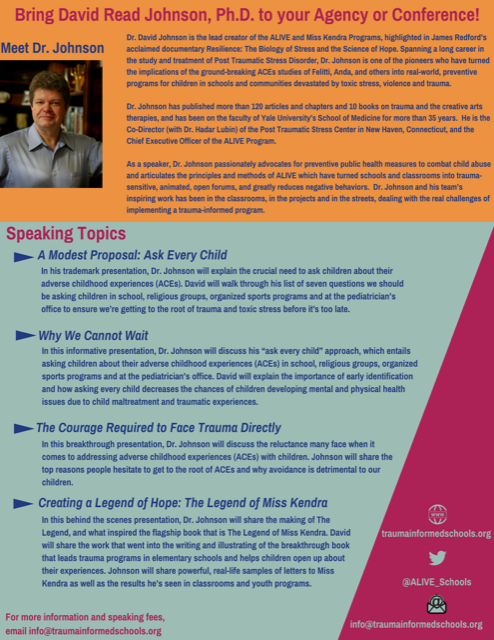 Click here to view Dr. Johnson’s speakers one sheet. The Trauma-Informed School: A Step by Step Implementation Guide for Administrators and School Personnel by Jim Sporleder,‎ Heather T. Forbes &‎ LCSW. Center on the Developing Child at Harvard University, "A Guide to Toxic Stress"
The New York Times, "This is a lady who figured out how to BE The One… ." The Washington Post, "Baltimore uses trauma research to improve life for poor parents and their children"
NPR, "Take The ACE Quiz-And Learn What It Does and Doesn’t Mean"
Roger Ebert Interviews, "Fanning The Flames Of Awareness: James Redford On 'Resilience'"
The Guardian, "How Childhood Stress Can Knock 20 Years Off Your Life"
The Atlantic, "Teaching Traumatized Kids"
The Adverse Childhood Experiences (ACE) Study is one of the largest investigations ever conducted to assess associations between childhood maltreatment and later-life health and well-being. The study is a collaboration between the Centers for Disease Control and Prevention and Kaiser Permanente's Health Appraisal Clinic in San Diego. A private health foundation that provides grants to community-based organizations throughout California. The Center for Youth Wellness is part of a national effort to revolutionize pediatric medicine and transform the way society responds to kids exposed to significant adverse childhood experiences and toxic stress. Founded in 2006, the Center catalyzes local, national, and international innovation in policy and practice for children and families. The ChildTrauma Academy (CTA) is a not-for-profit organization based in Houston, Texas working to improve the lives of high-risk children through direct service, research and education. Clifford Beers is a mental health clinic serving children and families in the Greater New Haven area. Their focus is on working with children who have experienced trauma — things like abuse, neglect, witnessing community violence, and loss of a loved one. Established by Congress in 2000, the National Child Traumatic Stress Network (NCTSN) brings a singular and comprehensive focus to childhood trauma. They are committed to raising the standard of care while increasing access to services. Combining knowledge of child development, expertise in the full range of child traumatic experiences, and dedication to evidence-based practices, the NCTSN changes the course of children’s lives by changing the course of their care. Prevent Child Abuse America is the national champion of great childhoods for all children. Post Traumatic Stress Center is a clinic specializing in the evaluation, treatment, and training for posttraumatic stress disorder and other trauma-related disorders. The Robert Wood Johnson Foundation supports research and programs throughout the nation which are working to build a Culture of Health. The Sanctuary Institute provides training and consultation services to the organizations that work with vulnerable adults, children and families with an aim to help an agency's leaders reclaim a culture of hope and innovation. This Toolkit provides practical tools and resources to assist law enforcement agencies in building or enhancing effective operational responses to children exposed to violence (with or without a mental health partner). This toolkit contains tools targeted to police leaders and frontline officers. Several tools were first developed for the Protecting and Serving: Enhancing Law Enforcement Response to Children Exposed to Violence training curriculum for frontline police officers, developed and launched by the IACP, Yale and OJJDP.